this story is about a wasp and a bird. 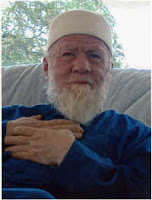 my Shaykh Sa'id al-Jamal (Sidi), may Allah be pleased with him and sanctify his Sirr, told this story from his own life in one of his visit to US. Sidi was about thirteen years old and it was harvest time in the village where he went to visit his relatives. everywhere people were harvesting the grains, chafing the wheat etc. at one point a wasp came to his attention. it was picking up a single wheat grain each time in its mouth and flew back. after a while it came back again to pick another grain and flew. when Sidi saw it happening for the third time, it came to him, "there's a story behind what this wasp was doing". so he decided to catch this wasp without doing it any harm. with all the enthusiasms of a teenage boy, thanks to a little box and very thin thread he caught the wasp. then tied the thin thread to one of its leg and let it go. interestingly, without delay it came back and picked up another grain in its mouth and flew away. now following the thread curious Sidi tracked the wasp as it started its return journey. after it flew about two hundred yards, it hovered close to ground and made a sound. 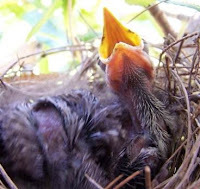 from distance there Sidi saw a little nest on the ground, then heard the voice of a bird and it was opening its beak. going down, the wasp dropped the grain into the opened beak of the bird. Sidi went close to the nest and took this bird in his hand only to find that this bird had no legs and it was blind. Sidi told afterwards that the whole chain of events was a great surprise to him and left a significant impact in his heart. about the story Sidi mentions that this story gives us a way and gives to all people a certain understanding how Love and Mercy should be expressed. this story is a teaching from Allah about deep love and true mercy that each human being aspires to. this story also tells the depth of love go beyond the human being and are also experienced amongst other creatures of Allah, like birds and insects. the outstanding story reminded me of the great statement of Christ on loving one's neighbor (Matthew 22:39) and how beautifully the wasp was demonstrating exactly that. the equivalent teaching of the last divine messenger to humanity, Muhammad was, "none of you truly submit to divine (become muslim) unless he (or she) loves for his fellow brother (or sister) what he loves for him." we often reduce religious / spiritual / moral teachings to mere theoretical knowledge and nothing but empty sweet talking. far important than just knowledge and overloaded information are sincere action in the physical world. we being physical beings, even the very idea of love remains hollow and empty if nothing is acted upon it when it's necessary. where its applicable, love manifested in action is much more powerful than assumed love that reside only in the realm of mind. helping the helpless, attending to needy or feeding the hungry is much more powerful and meaningful in terms of love's manifestation than merely reading hundred pages of scripture or spiritual books. what was inspired to the wasp and its action is also a bold demonstration of how God is the provider of all. Allahu ar-Razzaq, God the Provider. Allahu al-Wahhab, God the Bestower. It is through the all encompassing Divine mercy which takes care of all. even the blind and paralyzed bird is also been taken cared of through another species in such an amazing way.